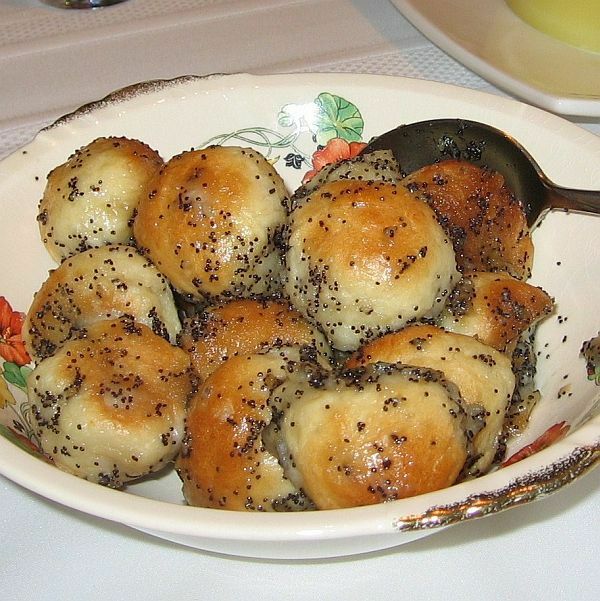 Bobalki (also spelled bobalky, babalki, babalky) are Slovak baked balls of dough. They can be served sweet with ground poppy seeds and honey, or savory with sauerkraut and onion. They are a favorite for Slovak Christmas Eve, known as velija, and during Lent, but these light and airy balls of dough are delicious any time of year. View this image gallery of a Slovak Christmas Eve Velija. In a medium saucepan, bring to boil 2 cups water, 3 tablespoons sugar, salt, and oil or butter if not fasting. Cool to lukewarm. Meanwhile, dissolve yeast in 1 tablespoon sugar and 1/2 cup warm water. Place flour in the bowl of a stand mixer or a large bowl. Add lukewarm water-sugar-oil mixture and yeast-sugar-water mixture. Combine thoroughly and knead until smooth, about 7 minutes in the mixer and at least 10 minutes by hand. Cover and let rise until doubled. Punch down dough and turn out onto a lightly floured surface. Roll dough 1/2- to 1-inch thick and cut into pieces that will result in 1-inch balls when rolled between the palms of the hand. Place on a parchment-lined or well-floured cookie sheet with dough ball sides touching. Heat oven to 375 F. Let rise, covered with oiled plastic wrap until nearly doubled. Bake 15 to 20 minutes or until lightly browned. Cool completely. Grind poppy seeds in a mortar and pestle with a little water or milk and set aside. When the bobalki are cool, break the balls apart and place them in a colander. Pour just enough boiling water over bobalki to soften them but not turn them into mush. Drain well. Pour warm honey and ground poppy seeds over all. Stir lightly and serve immediately. Instead of using poppy seeds and honey, rinse a 1-pound can sauerkraut and squeeze out all moisture. Sauté chopped onion in butter (or oil if following a strict fast). Mix with baked bobalki and season with salt and pepper to taste.